This Irish blessing plaque features the following verse: May your blessings outnumber the shamrocks that grow and may trouble avoid you wherever you go. 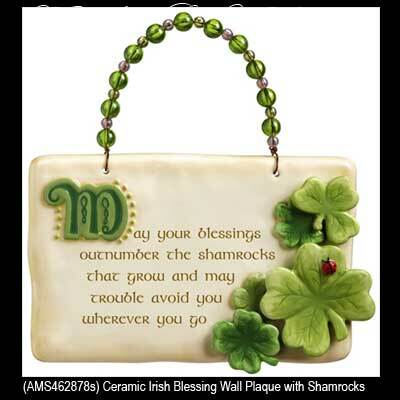 This wall plaque features an Irish blessing that is enhanced with shamrocks and clovers. The ceramic Irish blessing plaque has a raised dimensional design that measures 6" wide x 4" tall, not including the beaded wire hanger.